← How to annotate PDF by free online annotator? Today VeryPDF Free Online PDF Annotator has been released. This is one of the VeryPDF cloud based application, by which you can annotate PDF online easily. Now let us check functions below. Even if we name it as PDF annotator, but this software could be used to annotate PDF, DOC, DOCX, XLS, XLSX, PPT, PPTX, HTM, HTML, TXT, RTF, GIF, JPEG, JPG, PNG, TIF, TIFF, Multipage TIFF documents in Online Document Annotator. This is could based application, you can use it directly online without downloading any software to your computer. If you are VeryPDF cloud application user, you can free use this software together with other PDF conversion, generation cloud applications. By this application, you can annotate PDF, view PDF without any PDF reader installed, add comment to PDF, add text to PDF, strikeout PDF. The output PDF file could be viewed at any devices, cellphone, and any system. This software is compatible with all the system and all the platform. You can use it at any place where there is website connection. Comparing with buying a desktop PDF annotator, this software is quite check. You just need to spend less than 20$ then you can use it freely the whole month without any limitation. The following snapshot is from software interface, please have a check. When you use this software, please open website of Free Online PDF Annotator. Then you will see all the details steps have been marked clearly on then website. 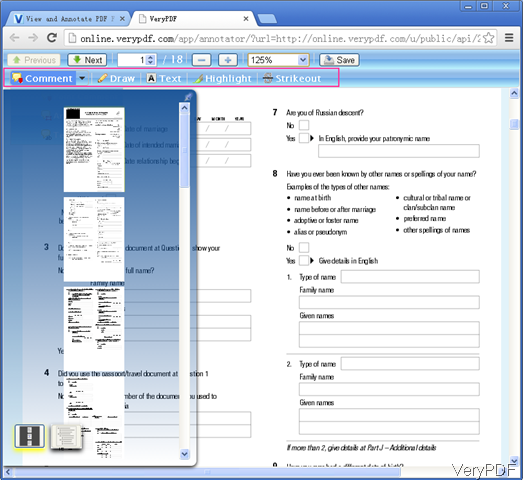 This software allows you to upload local file or online file to this PDF annotator. If you need to upload local file, please click button Browse. If you need to upload online file, please input the URL of online file below. If you have the API code, please input in the API code part. If you do not input API code, there will be watermark on output, which is like trial version software. When you finish uploading, please click button Upload Now, then you can go to the PDF annotator interface like the first snapshot shows. In the PDF annotator part, you can find all the pages listed there. You can use it as PDF viewer. You can annotate PDF according to you needs. Simply click button above then you can make related actions. When you finish editing, please do not forget to click button Save. To save it a new PDF file. By this PDF annotator, you can annotate PDF online easily. During the using, if you have any question, please contact us as soon as possible. This entry was posted in VeryPDF Cloud API and tagged PDF annotator. Bookmark the permalink.